Exercise bikes have long been the health equipment of choice for the average user wanting to get a good cardio workout in the comfort of their own home. This makes sense because they take up little space and are a tried and trusted method of keeping fit. These days, there are several types of exercise bikes available for home use. From the classic upright stationary bike, to the more comfortable recumbent style or even an under the desk peddler. There are many to choose from. Besides the peddler, some of these exercise bikes can be big and bulky, especially the recumbent bikes. However, in this article Best Exercise Bikes For Small Spaces 2019, we will be reviewing the various types of small, compact and folding exercise bikes, so that you can find the perfect size and style of bike for your home. If you are interested in folding treadmills or some compact elliptical machines suitable for home use, then click on the links. A bestseller with almost 5,000 positive reviews on Amazon, this stationary exercise bike by Exerpeutic is a very popular bike at the moment. Compact, sturdy and with the fold up feature, it is a perfect choice for fitting into small spaces and for easy storage. The bike is very easy to assemble and should take no more than 30 minutes. The main body frame comes already pre-assembled and the tools required for assembly are included. The instructions are easy to follow and are in picture form. All that needs to be attached are the seat, the leg stabilizers, pedals and display unit. Its overall measurements fully extended are 31” L x 19” W x 46” H, which is very compact and ideal for small spaces. However, it can also be folded up to almost half its size for easy storage. Its folded dimensions are 22” L x 20” W x 55.5” H. Another handy feature for storage is the transportation wheels that allow you to wheel it from place to place. First of all, with a weight capacity of 300 lbs, its heavy duty frame is one of the strongest on the market. It is easy to get on and off and can can be adjusted to fit people of 5’3” to 6’1” in height. The seat is quite large and comfortable. It provides a very smooth and quiet performance and definitely won’t interfere with the TV or music. The tension levels are easily adjusted by turning the knob on the main frame. This compact exercise bike by Exerpeutic, is a very popular choice by the public and we can see why. For the price, this bike is a real bargain. It is a real space saver, with its compact design and foldaway feature and is ideal for small homes. If you need a heavy duty, compact, folding exercise bike, then this one is our No.1 recommendation. Another compact, folding exercise bike to choose from and at an affordable price. The choice of space saving bikes for small spaces is a lot and this one by Marcy is definitely a great option. The bike is very easy to assemble and should take around a half an hour. The main frame arrives already assembled and all that is needed is to attach the seat, handlebars and leg stabilizers. Any tools required and instructions are provided. This bike is a real space saver with overall dimensions of 32” L x 18” W x 42” H. If left fully opened all the time, it won’t take up too much space, however if you really want to save space, then fold it up to less than half its length. It folds up to a tiny 14” L x 18” W x 51” H. With a weight of only 37 lbs, it is also easy to transport and store in a corner. Overall, it is perfect for small homes. First of all, the bike works very smoothly and is also very quiet. No issues with performance. The seat may be a little on the hard side, therefore buying a gel seat cover for it, might be a good idea. It is also a partially recumbent bike, so the pedals will be at a slight angle. This makes a difference when trying to reach the pedals for smaller people. There are mixed reviews on what height is the minimum for comfortable leg reach. Some say 5 feet is enough, however many have said 5’2” should be the smallest height. Overall, a solid, good value, compact exercise bike, that will provide a smooth and quiet workout. 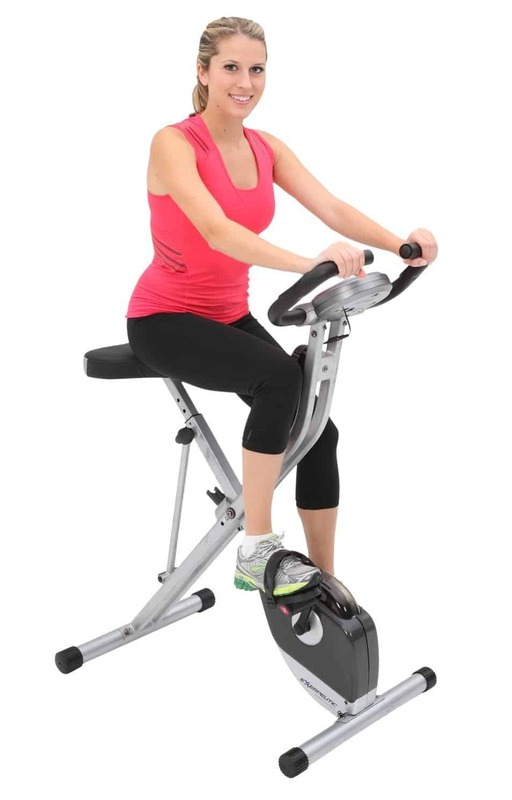 This compact, portable and solid exercise bike is great value and highly rated. The fold up feature is perfect for easy storage and its small footprint is perfect for small spaces. Not only does it work smoothly and very quietly but the slight recumbent angle of the pedals also gives a nice workout for the thighs and glutes. This heavy duty exercise bike is the big brother of our No.1 choice above. It is constructed with 20% extra steel and has a weight capacity of 400 lbs. It is a little bit more expensive and a little larger, however it is still compact enough for a small area. Simple to assemble and comes with tools and detailed instructions. The majority of it is already assembled and all that needs to be attached is the seat, pedals and leg stabilizers. This one is the largest we are reviewing here with measurements of 39” L x 48.4” H x 26.4” W and weighs 51.6 lbs. It is a heavy duty bike and ideal for the heavier person. Although, it is a little larger, it is still quite compact and its folding feature allows it to be folded up to almost half its length (Folded Dimensions: 26.4” L x 24.8” W x 57.5” H). It also has transportation wheels, making it very easy to move around. The large seat is suitable for all sizes and is also adjustable, which will suit users between 5’1” and 6’5” in height. It gives a smooth and very quiet cycle and with 8 different tension levels, there should be enough to challenge all users. This is a stable, sturdy bike that will be solid through vigorous exercise. It is especially suitable for larger people, due to its high weight and height capacity. This heavy duty exercise bike by Exerpeutic, although a little larger than the other compact bikes, is still suitable for small spaces. It is solid, stable and a great choice for heavy people and very tall people. It is comfortable to use and super quiet. This one is a little bit more expensive than the others, however it is still a good value buy and definitely worth considering. When choosing a recumbent bike, we were looking for comfort, performance and solid structure. 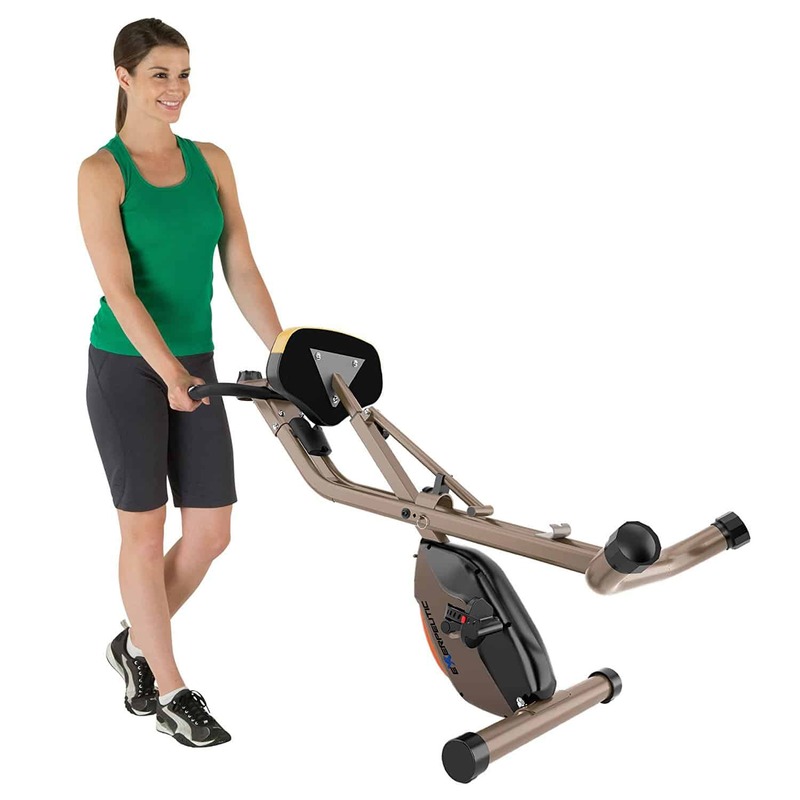 The 400XL by Exerpeutic is solid, very comfortable and you get a challenging workout. Its compact, semi-recumbent design is ideal for small spaces and its folding feature is great for storage. Tools and very detailed instructions are supplied. In fact, the instructions make assembly look far more complicated than it really is because there are too many details. Almost all of the bolts are already in the right place, so it isn’t difficult to do the rest. Shouldn’t take much more than 30 minutes to assemble. Ready to use, this bike measures only 33” L x 19” W x 46” H, meaning it has a small enough footprint, especially for a recumbent. However, it also folds up to measure only 20” L x 17” W x 54” H and has transport wheels, which means it is an ideal choice for storage. Its compact design makes it a real space saver for homes with limited free space. The seat and back rest are very comfortable to sit on and we really like the incline design of the back rest because it really makes the workout very relaxing. With 8 levels of tension to choose from, you can definitely get a challenging workout from this bike, therefore it is suitable for all fitness levels. Recumbent bikes are usually quite large and not great space savers, however, with its semi-recumbent design, this 400XL bike is very compact. It is a solid bike in performance and structure and great value for the price. Also, the incline and extra large seat make the workouts more comfortable and relaxing. If you are looking for a folding recumbent bike, suitable for a small space, then this one is the perfect choice. This may be the budget choice in this article, however the majority of these reviews are of similar priced bikes and all are equally as good as each other. This upright compact bike by Marcy, is ergonomically designed to give an effective and comfortable workout. It is also a compact size, with a small footprint. Minimal assembly required and all the necessary tools are provided. Marcy recommend that more than one person should assemble this bike, however it won’t be any more difficult to assemble than any other exercise bike. This upright exercise bike measures 31.5” L x 48.75” H x 18” W, which is compact and compares well size wise to any other exercise bike. However, this bike does not foldaway. This shouldn’t be a big issue because of its small footprint. If you don’t intend to store your exercise bike away each time you are finished with it, then this bike is a great value choice. It is quiet to use and gives an effective cardio workout. There is no pulse monitor to check your heart rate, however this shouldn’t be a deal breaker. The pedals are counterbalanced to give added support and control and also have foot straps to keep the feet in place. 8 levels of tension will challenge all users. Smooth, quiet and lightweight, it is a solid exercise bike for a low price. It may be a little bit cheaper than the others, however it is still a solid, sturdy and comfortable upright exercise bike with a small footprint. It doesn’t have the folding feature, however its compact design makes it a real space saver. If you don’t plan on storing your exercise bike away when not in use, then this bargain bike is a great choice. For the ultimate in storage, portability and convenience, this pedal exerciser could take the place of any exercise bike. No matter how compact an exercise bike is, it will still take up some space. However, this pedal exerciser by DeskCycle is a fraction of the size of an exercise bike, so would be ideal for places with very limited free space. It is very easy to assemble. Tools and instructions are provided and it shouldn’t take more than 5 minutes. All that is needed to do is to attach the legs and then the pedals. Finally, snap in the monitor and it is ready. Its overall measurements are 24” L x 20” W x 10” H and only weighs 23 lbs. As a space saver, it is a lot better than the smallest of exercise bikes. Store it in a closet, under the bed or up against a wall in the corner. It is also very light, therefore easy to carry from place to place. First of all, pedalling is very smooth and silent. 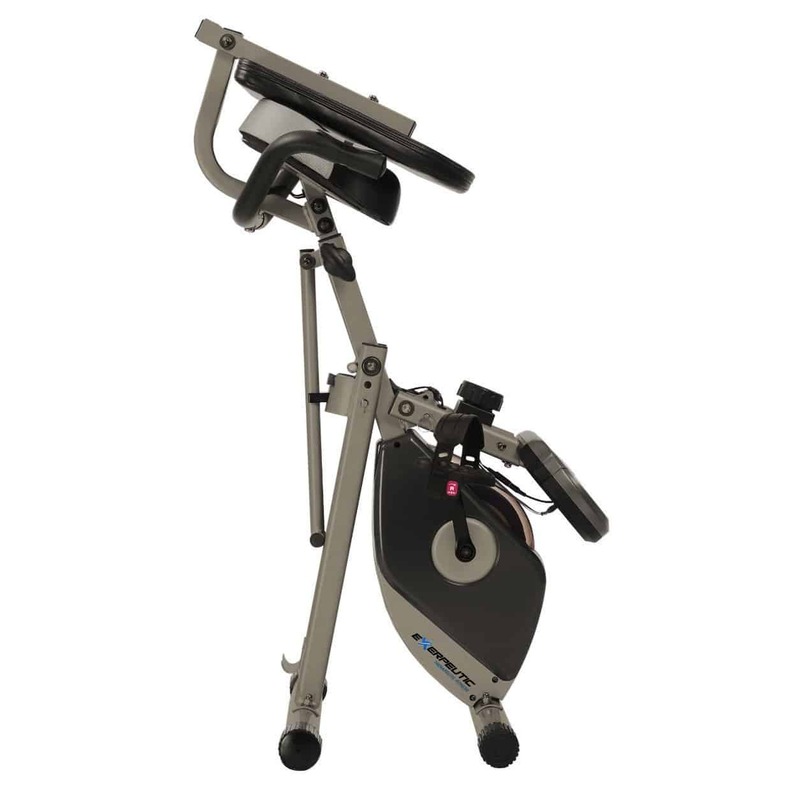 This pedal exerciser was designed to be used in the work environment, therefore a very quiet pedal motion is very important. Next, what sets this one apart from its competitors is that the pedals are lower, meaning it works a lot easier under desks (no hitting knees under the desk). It also has twice the resistance range compared to other pedal exercisers, meaning a challenging workout can be had by all levels. The DeskCycle is not only perfect for exercising while at work but it is also one of the smallest pieces of cardio equipment you can find. This means it is a perfect choice for small homes and an ideal storage solution when free space is limited. If you sit down all day at work, then this exerciser is a great way of fitting in some exercise while you are busy working at your desk. Do you use your laptop often? For hours a day? Do you work at an office desk often? Or even have a home office? Sitting down for long periods of time is not good for your health, however if you want to keep active while working, then this work desk exercise bike by Exerpeutic could be what you are looking for. It is a compact, fold up, semi-recumbent exercise bike that has a desk attached, for you to place your laptop or work documents on top. It is easy to assemble and can be done alone, however two pairs of hands will make the job quicker and easier. Everything that is needed to assemble is provided and the instructions are clear and easy to understand. The assembled dimensions of this bike are 45.25” L x 25” W x 51.25” H, which makes it one of the larger bikes being reviewed here. However, it does fold up to less than half its length at 21.3” L x 25.5”, meaning it will have a very small storage footprint. The bike also has transportation wheels attached, therefore will be easy to move around from place to place. So if space is limited, its foldaway feature is just as compact as the smaller exercise bikes in the reviews above. First of all, it has a large cushioned backrest which makes working and cycling very relaxing and comfortable. Secondly, like the other Exerpeutic bikes, it has a smooth and quiet pedal motion, with 8 levels of resistance to make the workout as easy or as challenging as you need. The desk can be adjusted at 3 different angles and if you want to use it as a stand up desk, then it can be adjusted flat. Overall, it is a good quality exercise bike that is both comfortable and smooth to use. 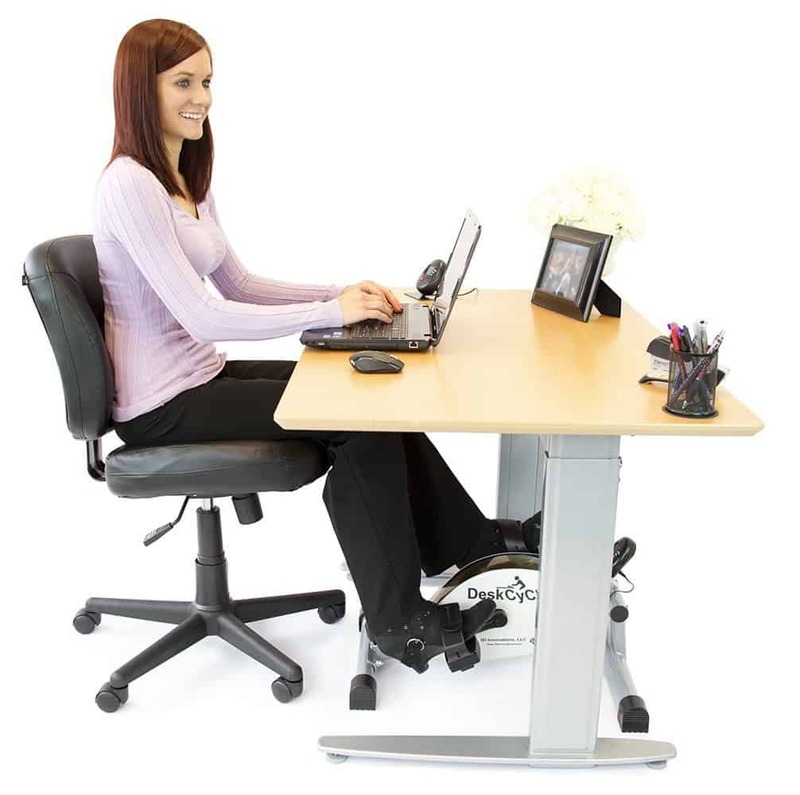 The desk makes it stand out compared to the rest, making it an ideal choice for those working at home, sitting down all day and want to get some exercise into their sedentary lifestyle. As more and more people are working at home and leading a more sedentary lifestyle, being able to exercise while working is a very valuable health benefit. This exercise bike by Exerpeutic, is a perfect way to get this exercise in while sitting on a comfortable seat and using a well designed desk for your laptop. This bike may not be the smallest, however its folding feature makes it perfect for storage and ideal for small spaces. Depending on the size of the room you will be placing the exercise bike, there are various sizes of bikes to choose from. If you plan to leave the bike in the same place all the time, then a compact small size exercise bike will be the most suitable for you. However, if you don’t mind storing the bike after every workout, then a foldaway option is the best choice. These folding exercise bikes can be folded up to half their size making it very valuable for small spaces. Also, all of the reviewed bikes above have transportation wheels attached, making it very easy to move them around. Whether you prefer an upright exercise bike, a recumbent bike or a pedal exerciser, is a personal choice. Upright exercise bikes are the classic types of bike and have the smallest footprint. The recumbent bike is more comfortable, however it has the largest footprint. The recumbent bikes above are semi-recumbent, which means they will have that added comfort but will also be almost as compact as an upright bike. 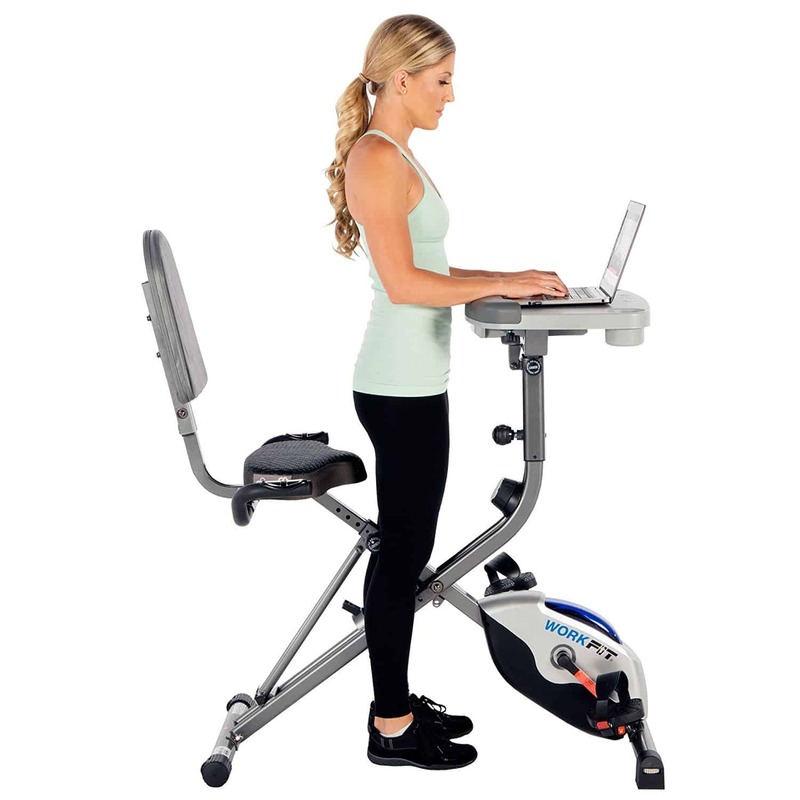 The ultimate space saver is the pedal exerciser, which is small enough to fit under a desk. The pedal exerciser is the easiest to store and the most portable. Whichever type you choose, there is a small, compact option available above. Whether it is an indoor bike or an outside bike, there are many different budgets to choose from. It just so happens that all of the bikes above are in the affordable range. They may all be a bargain price, however they are all very good quality. Competition is high amongst home exercise equipment manufacturers, therefore finding a high quality, great value compact exercise bike, has become a lot easier. An exercise bike is one of the most popular pieces of home exercise equipment and should be well maintained to allow you to get many years out of your investment. After every workout make sure that you wipe off any sweat that has dripped onto the bike. 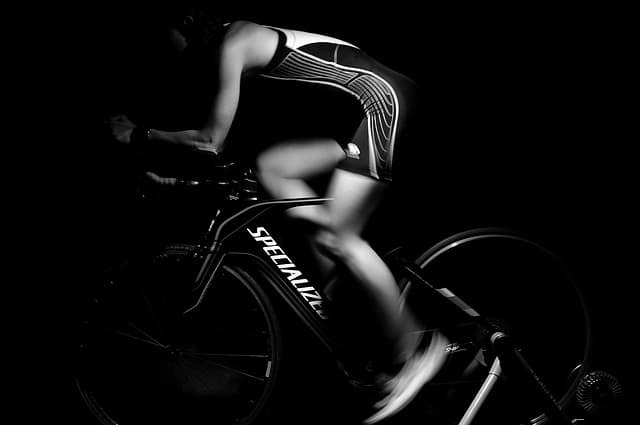 Sweat can cause damage to your exercise bike in a number of ways. Sweat left on the paint and powder coat can be corrosive over time and then cause rust on the steel underneath. Make sure you also wipe the sweat off of the LCD screen because if it finds its way into the device, it may cause problems. The pedals and frame should be tightened on a monthly basis to ensure the exercise bike is running at its best. Loose screws can not only cause annoying noises, but can also make the bike less stable and over time can cause damage. Make sure to check the maintenance guide that comes with your new exercise bike and follow the instructions provided, so that you can not only get the best use of the bike but also make it last for years to come. 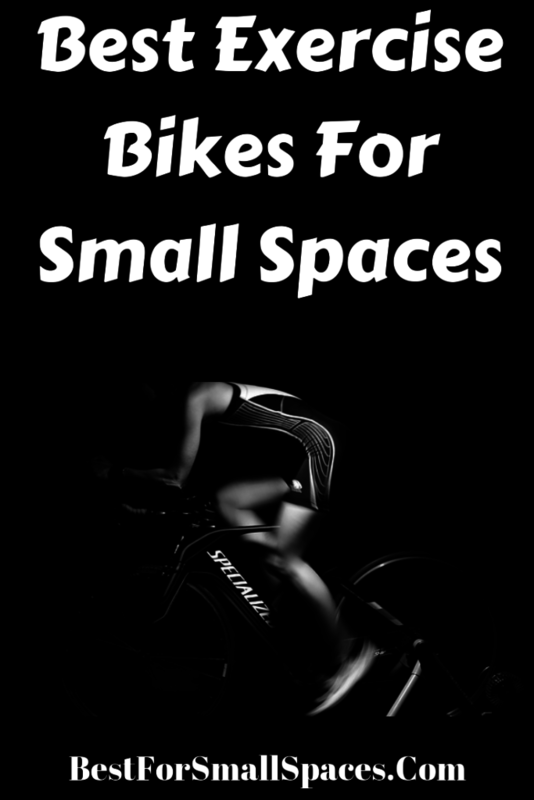 We hope that you found this article on the Best Exercise Bikes For Small Spaces 2019, helpful. We were pleased with the choice of quality and the prices of these exercise bikes and believe they are some of the best available on the market. If you would like to see some more exercise options for small spaces, then why not also consider compact rowing machines or even mini trampolines. Whether, you want a compact upright exercise bike, a folding recumbent exercise bike or a small pedal exerciser, we hope you were able to find the perfect one for your small space.